This study explored preservice elementary teachers' and their mentors' understanding of the essential features of inquiry-based teaching through the use of evidence-based reflection. The web-based video analysis tool (VAT) system was used to support preservice teachers' and mentors' evidence-based reflection during field experiences. Major data sources included VAT reflections and individual interviews. 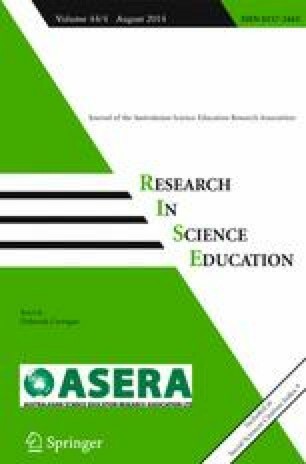 Data analysis indicated that the preservice teachers had been involved in various activities designed to support their understanding of inquiry features in a science methods class; they did not implement all of the features in their actual teaching. Both preservice teachers and mentors had difficulty connecting appropriate inquiry features to each teaching episode, which indicates their lack of understanding of inquiry. Both the preservice teachers and mentors had different levels of understanding for each feature. That is, they tended to understand certain features better than others. They interpreted each feature of inquiry-based science teaching too broadly. They also either had a teacher-centered view or tended to focus on issues unrelated to science teaching. In an inquiry lesson, scientifically oriented questions provide the foundation for other inquiry features such as collection, analysis, and explanation of data (Asay and Orgill 2010). For this feature, scientifically oriented questions can be developed by both the teacher and the students. The teacher can generate questions or adopt the questions from instructional materials or other sources. This feature can be connected to the episodes in which the scientifically oriented questions guide the students to engage in empirical investigation, or any activity that aims to collect and analyze data to explain scientific phenomena (National Research Council 2000). This feature can be connected to the episodes in which questions are answered by students’ observations and scientific knowledge they obtain from reliable sources. Thus, any activity in which the questions guide students to engage in a class discussion, problem solving, student research, or an individual or group project can be connected to this feature. The episode that encourages students to develop their own questions to investigate can be connected to this feature. However, the episodes in which a teacher uses questions to probe student understanding, or a student asks questions to seek an answer from a teacher, cannot be connected to this feature. In one episode (Ep4, 23:27–27:25) of Matthew’s Lesson 1 (Grade 2), the students engaged in an activity designed to find an answer to a scientifically oriented teacher question. In the episode, Matthew prepared different group activities. He asked the members of each group to find the differences between two fruits. To answer this question, the students in the group used different tools and measured the weight and length of the fruits. F2(EP): learners are encouraged to participate in their own exploration to collect and/or analyze evidence. This feature requires students to give priority to evidence. Evidence plays a critical role in scientific investigation and it provides the foundation on which students construct scientific concepts (Asay and Orgill 2010; Chinn and Brewer 1998, 2001). During inquiry, students need to participate in exploratory activities to collect and/or analyze evidence in order to develop and evaluate explanations that address scientifically oriented questions (American Association for the Advancement of Science 1993; National Research Council 2006). Exploratory activities may include group hands-on activities, whole class activities and discussions, student research, individual or group projects, problem solving, etc. Data collection or analysis can be guided by a teacher, but explorative activities require students to develop their own explanations based on data analysis. Explorative activities require students to use various science process skills such as observing, classifying, predicting, collecting data, inferring, etc. Students are required to use evidence when they generate explanations for scientific phenomena in exploratory activities. Only activities that include the process of collecting or analyzing evidence are able to be connected to this feature. For example, an activity that involves simply finding answers for worksheet questions in a textbook does not require the students to collect or analyze evidence to generate explanations. In Heidi’s lesson 2 (Grade 4) on conduction, she encouraged the students to participate in their own exploration using various science process skills. In the episode of her lesson 2, Heidi showed a pot with a metal fork and wooden spoon and asked the students to predict which one would be a better conductor. Then, the class discussed how to design an experiment and collect data to test their prediction. The students also drew their own conclusions based on the data they collected and recorded. F3(EX): learners formulate explanations from evidence to address scientifically oriented questions. Students’ explanations should go beyond current knowledge and propose some new understanding based on evidence and reason (National Research Council 2000). When students generate their own explanations, students clarify or reorganize information in new ways, recognize and resolve inconsistencies in understanding, and develop more elaborate conceptions (Chi 2000). This feature can be connected to the episodes in which students formulate explanations using evidence they collect by empirical investigation and analyze or any activity that aims to collect and use data to explain scientific phenomena. The activity may include experiments, discussions, problem solving, student research, and individual or group projects. The evidence includes empirical evidence gained through science processes. The evidence also includes new knowledge or information from reliable sources. Thus, the episode in which students generate their own explanations or answers for scientific questions through their research or problem solving can be connected to this feature. This feature cannot be connected to the episodes in which students try to generate their own explanations, but the explanations are not supported by evidence or new understanding. In Kathryn’s lesson 2 (Grade 2), students drew their own conclusions based on data they collect through experiments. The students were asked to explore three different types of soil. They were able to look at, feel, and smell the soils and were allowed to do anything they wanted to draw their own conclusions regarding the similarities and differences among the three types of soil they observed. F4(SE): learners evaluate their explanations in light of scientific explanations. By connecting their explanations to accepted scientific principles, students build their own conceptual framework, which allows them to chunk information efficiently (Asay and Orgill 2010). Students may also ask if there are any biases or flaws in the reasoning or if other reasonable explanations can be derived from the evidence (National Research Council 2000). This feature can be connected to the episodes in which students evaluate or revise their own explanations in connection with new scientific knowledge gained through the lesson. The episode in which students compare their results or explanations to those proposed by the teacher or instructional materials can be connected to this feature. The episode in which students evaluate whether their explanations are supported by evidence or adequately answer the questions can be connected to this feature. In an episode in Heidi’s lesson 4 (Grade 4), Heidi asked the students to define conduction. When a student answered that conduction is transferring energy, Heidi reminded the students of the experiment in which they compared which object conducted heat faster—the metal spoon or wooden spoon. The student realized that his answer was insufficient and added that objects need to be touching in order for conduction to occur. The student evaluated and modified his explanation because he remembered that they had touched the metal spoon and wooden spoon and concluded that the metal spoon was the better conductor. In the episode, the student revised his explanation, connecting it to new knowledge he had learned in the previous lesson. F5(CJ): learners communicate and justify their proposed explanations. By communicating and justifying their explanations, students can provide others the opportunity to “ask questions, examine evidence, and suggest alternative explanations for the same observations” (National Research Council 2000, p.27). By communicating and justifying their proposed explanations, students can also resolve contradictions and solidify an empirically based argument. This feature can be connected to the episodes in which students share their explanations with a teacher or peers as they justify the explanations with the evidence, existing knowledge, and other sources. The episodes in which students try to communicate their explanations—but not justify them—cannot be connected to this feature. The episodes in which a teacher encourages students to justify their explanations, but students provide only explanations without justification, likewise cannot be connected to this feature. For example, in her lesson 1 (Grade 3), Jessie put some ice in a plastic bag and sealed it. After putting the bag near the window, she asked the students to make predictions about what they thought was going to happen in the bag over time. As the students made predictions, they explained why they made that prediction. In lesson 2, which was conducted on the next day, after observing the bag, the students confirmed whether their predictions were correct and explained what happened in the bag and why it happened. In the episodes, the students communicated and justified their explanations and had a chance to resolve contradictions or solidify their explanations based on empirical data. F6(DA): learners are evaluated by various diagnostic assessments throughout the lesson. We added this feature to NSES’ five essential features of inquiry teaching. An appropriate mindset for implementing inquiry is constructivism. According to constructivism, learners construct their own knowledge based on their prior experiences and previously held understandings (Driver et al. 1994; Llewellyn 2007). Thus, diagnostic assessments that probe students’ preconceptions or misconceptions can be an important feature of inquiry teaching and learning (Llewellyn 2007). In the inquiry lessons, teachers also assess student progress throughout the lesson. This feature is connected to the episodes in which a teacher starts the lesson by probing what the students already know. This feature can be connected to the episodes in which a teacher assesses what students know about the target concept during the lesson. The assessment includes both formal and informal assessment. Inquiry-based learning can be assessed using various alternative assessments throughout the lesson. Thus, this feature can be connected to any episodes in which a teacher assesses student learning by using various alternative assessment methods such as questioning, drawing, concept maps, journal writing, etc. Drake asked the students (Grade 3) to turn in a journal entry describing what they did or learned that day. She used this journal to assess whether students had accomplished the instructional goals of the lesson. Jessie showed vocabulary cards regarding the water cycle to the students (Grade 3) and asked what they knew about the words or what they thought the meaning of each word was. She used the cards to get a better understanding of what they already knew, so that she could correct any misconceptions they might have had during the lesson.